Patrik Lindström EBM, Industrial I've been trying to come up with something to write in this review now for days. Before I start writing a review, I always try to have come up with a few good lines to add to the review, the strong points of it, you might say, and from that I tend to evolve it out to a full review. With this release I had some serious problem coming up with a base from where I could build up my review. It is very hard for me to get a grip of this album, when I think I got it, it always slips away like an eel made of butter crème. So what I can't I get a grip of it? Well, that's what I?m going focus on in this review. 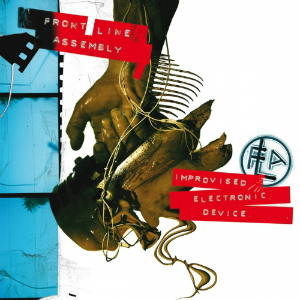 'Improvised Electronic Device' (a play with words of original version that is Improvised Explosive Device, which is home cooked explosive devices usually mentioned together with terrorism) is a very varied experience. On one hand you got the ambient hard and danceable electronic music and on the other side you got the metal influenced industrial from the 'Hard Wire' era. I sometimes get the feeling that they are not exactly working together like a team. This is almost like a tree that has been hit by a thunder bolt; splinters are flying in all kind of directions, pointing towards all 360 degrees. If you are looking for singularity and musical unity, this album is not for you. You got tracks like "Hostage" which almost have a kind of The Prodigy beat to it, you got the techno CDS track "Shifting Through The Lens" and on the far opposite side you have the punkish industrial track "Stupidity" featuring Al Jourgens (Ministry). Some of the tracks I really enjoy, "Hostage" got a great vibe to it and is my favourite track together with "Shifting Through The Lens". I also enjoy "Release", "Laws of Deception", "Pressure Wave" and the calm "Afterlife". So all and all, this album has potential and you should check it out if you have some sort of relation to Front Line Assembly. I've been trying to come up with something to write in this review now for days. Before I start writing a review, I always try to have come up with a few good lines to add to the review, the strong points of it, you might say, and from that I tend to evolve it out to a full review. With this release I had some serious problem coming up with a base from where I could build up my review. It is very hard for me to get a grip of this album, when I think I got it, it always slips away like an eel made of butter crème. So what I can't I get a grip of it? Well, that's what I?m going focus on in this review. Me? I'm standing in the middle of it all with a confused look upon my face.